Coach Rick changed out my bushings for me last night before practice. This is what they looked like when he pulled them out. 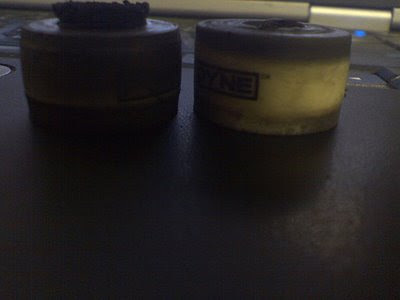 Once the new bushings were in, and my trucks were tightened down however, I felt a huge difference. When I would turn, I could actually dig in with my feet, as opposed to my ankles, and I didn't drift at all! It felt great, and was a huge confidence builder. Not only that, I took my socks off when I got home, and no bloody foot! Dill was so happy that he didn't have to deal with another night of, "EWWW! Look at this"! So skaters, save yourself some pain and suffering, swap out your dang bushings, and check your trucks! I love that your feet and ankles won't be having so much trouble in the future. And I hope that the team benefits too. Have a great time with them.